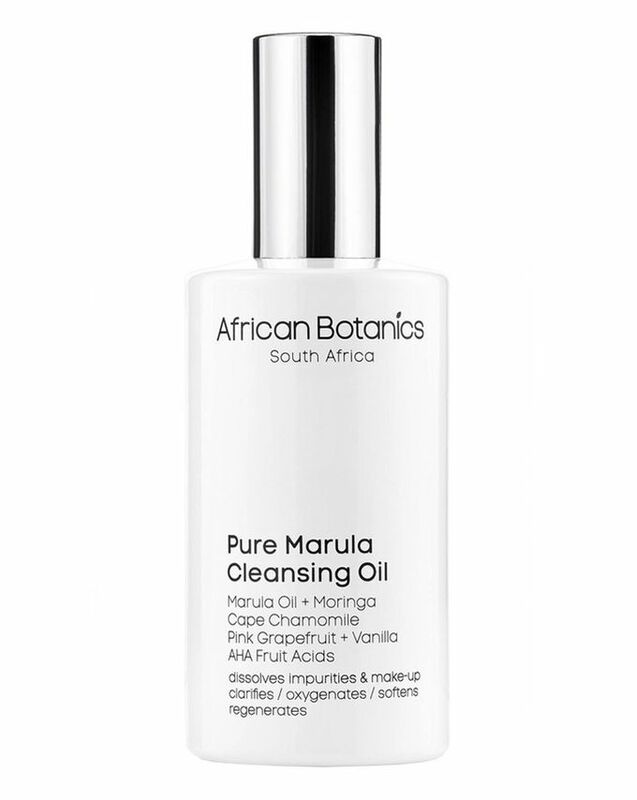 100% botanically-based, African Botanics’ Pure Marula Cleansing Oil is brimming with free radical-fighting antioxidants and strengthening omegas to gently melt make up and neutralise impurities. 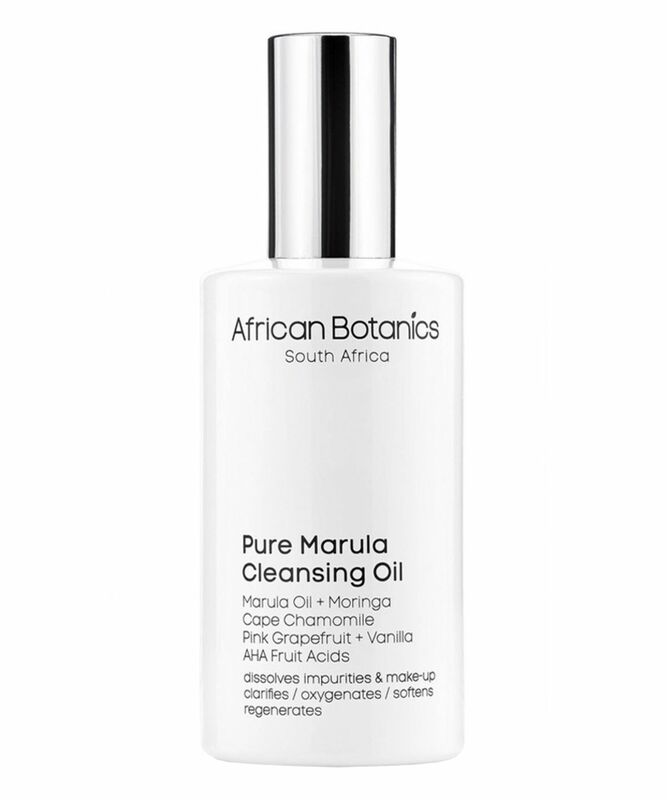 Emollient and aromatic, the brand’s signature Marula oil is blended with Cape chamomile and moringa oils – to combat inflammation and encourage detoxification – eliminating every last trace of residual grime, dirt and pore clogging oils without leaving your face feeling stripped. The inclusion of AHA fruit acids – derived from bilberry, pink grapefruit, sugar maple, sugar cane and lemon – then works to brighten and resurface; dissolving the bonds that bind dulling dead cells to skin’s surface, to revitalise and quickly recapture your complexion’s youthful luminosity. AM/PM begin with dry hands and face. Warm 3 to 4 pumps (more if necessary) of oil between hands and gently massage 1-2 minutes evenly using a circular motion over face and neck concentrating on forehead, nose, cheeks and chin. Apply warm water to form a light emulsion, then rinse thoroughly, finish with cold water. Repeat if desired. Glycerin, Capric/Caprylic Triglycerides, Aqua, Neopentyl Glycol Diethylhexanoate, Diisopropyl Dimer Dilinoleate, Sorbitan Oleate, Sclerocarya Birrea (Marula) Seed Oil**, Moringa Pterygosperma (Moringa) Seed Oil**, Adansonia Digitata (Baobab) Seed Oil**, Isoamyl Laurate, Lauryl Glucoside, Coco Glucoside, Eriocephalus punctulatus (Chamomile Cape) Essential Oil, Citrus Paradisi (Pink Grapefruit) Essential Oil, Vaccinium Myrtillus (Bilberry) Extract, Saccharum Officinarum (Sugar Cane) Extract, Acer Saccahrinum (Sugar Maple) Extract, Citrus Aurantium Dulcis (Orange) Fruit Extract, Citrus Medica Limonum (Lemon) Extract, Tocopherol Acetate, Dehydroacetic Acid, Benzyl Alcohol, Benzyl Benzoate*, Citral*, Citronellal*, Geraniol*, Limonene*, Linalool*. *Constituents Of Natural Essential Oils Used. **Certified Organic. 100% Vegan. Gluten-free. I didn't enjoy this product at all. It's more like an oily gel than a proper cleansing oil, and contrary to what the packaging says, I do need 5 or more pumps to clean my face. It barely emulsifies and my skin doesn't feel very clean after using. Doesn't smell like anything either. I had hoped this would calm down the occasional hormonal breakout, but nah. I'm glad I got this in a Cult Beauty promotion and didn't spend any money on it. Two stars for the clean ingredients. Having read many reviews about this I decided to give it a go. At first, it was very nice, emollient and felt lovely on the skin but after about 2-3 week it started thickening and the pump wouldn't dispense the product properly. If they changed the packaging, this would have easily earned itself 5 stars. Also, since I have very dry skin this wasn't as oily and emollient as I wanted it to be, but I can imagine it working for most people. I do love the fact that it mildly exfoliated your skin. This is very good!!! 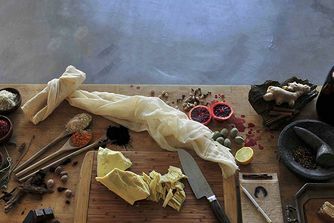 The whole African botanics brand seems excellent. I've purchased the enzyme polish and the marula oil and both have been brilliant. Something about the ingredients just suits my skin and it all smells absolutely amazing. I have finished my Sunday Riley ceramic slip cleanser and moved onto this. It smells deliciously sweet and cleanses very well leaving my skin soft and hydrated (I don't wear make up). I rinse it off with the help of a Konjac sponge. I have problems with occasional acne and hyper-pigmentation on my cheeks - so I am interested in seeing if it does brighten my skin in a few weeks. So far I do think I would repurchase 100% and look into buying more products from this brand. I have noticed that African Botanics do sell a lot more on their original website including another cleanser and body scrubs, would love if Cult Beauty would add these. This is a fantastic cleanser. Leaves your skin plump, soft and without the feeling of dryness that majority of cleansers do. I use it on a dry face with my hands dry as well, spreading it on my face with circular motions, and then use my Clarisonic for a minute, then I rinse. It transforms into an emulsion upon contact with water. I can not recommend it enough for everyone who are looking for a cleanser that will leave their skin baby soft. This is a gorgeous cleanser, and although I use it sparingly because I am prone to acne, it's fantastic for the times when my skin dries out. It also has the lovely side effect of healing the marks left by blemishes on my skin. I use it before an event, to give my skin a little glow and softness. Combined with a gentle exfoliant, whenever I use this I end up feeling like a queen. The oil comes in a lovely, well sealed glass bottle with a good quality pump in the package, so great if you want to re-stopper for travel. First thing you'll notice when you pump (3-4 pumps) and spread the product in your hands is the amazing, entirely natural creme brûlée scent - gorgeous! The oil spreads beautifully on my skin, and over 1-2 mins massage lost a little of it's slip. You could feel it working in my mind. A little drop of water to emulsify, and then the easiest of rinses and I was left with, and I genuinely mean this, the glow I had in my twenties - I swear! No irritation, no dryness, just rosy, soft, clarified skin. I'm so glad I've purchased this.